Following are the difference between N-type semiconductors and P-type semiconductor. N-type semiconductor P-type semiconductor It is type extrinsic semiconductor. It also type of extrinsic semiconductor. In N-type semiconductor, electrons are majority carriers and holes are minority carriers. Advantage of semiconductor diode over vaccum tubes The semiconductor diode has very small interelectrode capacitances. This is very important in high frequency application. 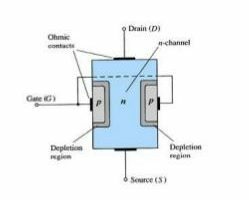 The semiconductor diode does not produce any current in the absence of applied voltage.